AHHHHHHHHHHHAHHHHHHAHHH! That is me screaming from the top of my imaginary building excited that I have been nominated by Worrywart for The Versatile Blogger Award. I want to thank her so much for reading and for the nomination because it has truly made blogging worth it. After two years of blogging I have never enjoyed it as much as I am now! I love reading everyone’s blogs as well as you reading and commenting on mine. It keeps me humble to know that everyone shares some of the same thoughts as I do. Your blogs have inspired me to keep going, especially those who write each and every day. You challenge me to do the same. Thank you again! 1. 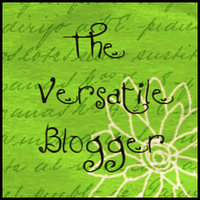 In a post on your, blog, nominate 15 fellow bloggers for The Versatile Blogger Award. 7 completely random things about me…. 1. I am blessed to serve an amazing God. 2. I have a very contagious laugh. 3. I am always hungry that explains me eating 5 times a day not including snacks. Don’t judge me. 4. I feel I have met my match and we both complement one another in the best ways. 5. I have this infatuation with Mexican food right now. 6. I love pickles and olives. 7. I have excellent penmanship. Congrats to all of the new award winners! I pray that you have not already won this award. My brain hurts from searching pages and trying to find who hasn’t. Be blessed! Congratulations you really do deserve this award! Please help! You were so kind to nominate me for the Versatile Blogger Award, but can you please explain why I have to do to upload it onto my blog? It’s just the rules of winning the award so that you are recognized for your work and if and when you are nominated again they already know you have the award already. Thank you for nominating me and for responding to my question. I’m pretty new at this, so I wasn’t sure what I had to do. What a way to start a New Year. Let’s hope we all get lots of good news in 2012. It’s okay. I’ve never won an award but I’m glad to share one. while that isn’t the same unwanted rehashed material. Fantastic read! LOL you are so funny, well congrats again I like what you’re doing!